Ascending Butterfly: Thursday, July 16, 2009 - Today's Words of Inspiration AND Three super giveaways! Thursday, July 16, 2009 - Today's Words of Inspiration AND Three super giveaways! We are one day closer to Friday! One of my favorite lessons in school was learning why each day of the week has it's specific name. Thursday is also known as -- Thor's day. Thor is the Norse god of thunder. He is represented as riding a chariot drawn by goats and wielding the hammer Miölnir. Where can you wield a hammer in your life? Not literally of course! But are there areas of your life that need radical change? I know mine does! Spend some time on Thor's day wielding your hammer for GOOD. Use it to break things. Break Bad Habits. Break through old pains, and truly let them all go this time. Use Thor's hammer in your life to make a new start. Who says renewal is only for Spring time? Remember, attitude really does determine altitude.It is OK to *Re-Tweet* the link to this post and You can find me (@Tracy_Iglesias) on Twitter here! 1. 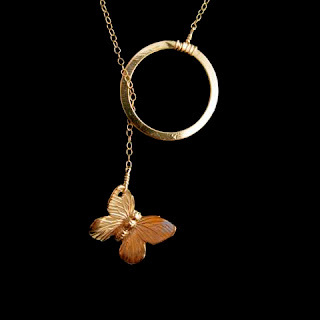 Enter to win a lovely Butterfly Kisses Lariat Necklace sponsored by Emily Elizabeth Jewelry HERE! 2. Enter to win one of TWO awesome pieces of shapewear sponsored by Tres Sleek HERE! Remember: Friday, July 17, 2009 is the LAST day to enter the Tres Sleek Giveaway! So get in your entries TODAY!